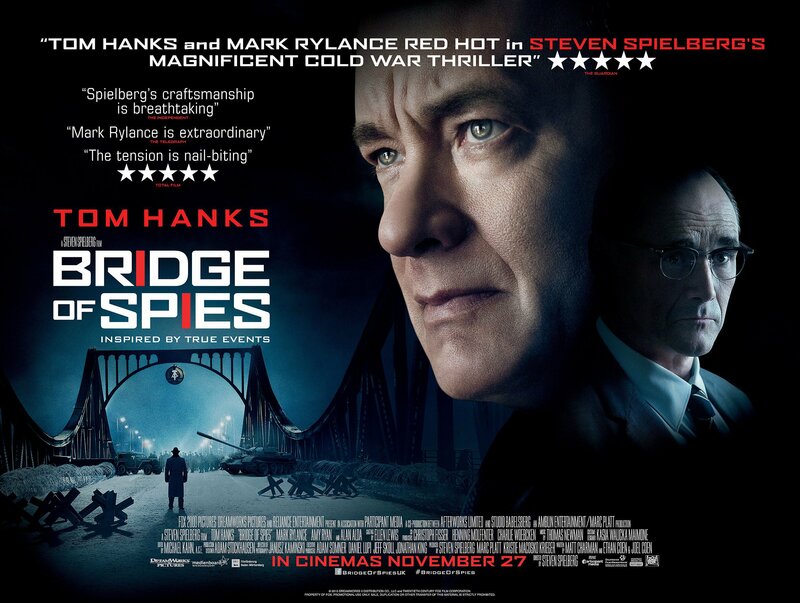 Bridge Of Spies is one of the most terrific historical drama I have seen in last few years. Directed by Steven Spielberg and written by the Coen brothers, the movie is somehow based on James B.Donovan’s book “Strangers on a Bridge“. James B.Donovan was an American insurance lawyer, who after his experience of Nuremberg Trials in 1945 (also mentioned in the movie) was asked by US Govt to defend Soviet spy Rudolf Abel. Now who was Rudolf Abel? Shortly speaking, Abel was born in UK to Russian émigré parents, which means born to the couples living in political exile. He served Soviet military and fought against Nazis in WWII. After the war, he lived as spy in US where years later he was caught by FBI. The director began his part in the movie from here and I think that was a good decision. The movie has two phases blended splendidly. One is Donovan/Abel phase and the other is Powers/Pryor phase. The other phase is story of two Americans. Francis Gary Powers was American pilot whose CIA spy plane was shot down by the Soviets in 1960 and Frederic Pryor, a graduate student, was caught by East German police without any charge a year later, who was studying there since 1959. Spielberg offers sharp visual historic presentation of the famous exchange occurred in Glienicke Bridge. The famous exchange scene has been shot at very same historic site. The dare and gallantry of James B.Donovan is well explained, his wit saved Abel’s hugely expected hanging sentence into a 30-year imprisonment which turned into nationwide massive shock. When it comes to tell history, the most important aspect to the viewers and readers is ‘deep intensity’. Spielberg successfully sketches deep realistic intensity hitting your head hard, specially at two different scenes. One is the court scene when the judge declares Abel’s punishment to 30 years instead of hanging, next 5 minutes are the peak of boiling points. The other scene is Donovan witnessing Berlin Wall shooting, facial expressions of Tom Hanks who plays Donovan here are priceless. Bridge of Spies is committed with 90% historical accuracy with slight alterations i.e., all critical points under the incidents happened and presented in the movie are true. Spielberg’s frequent collaborator John Williams did join to compose movie’s score but left for Thomas Newman due to health issues but Newman justified his musical presence and didn’t make us miss John’s score. Production and costume designs were super-excellent, one simply cannot expect an error in these two departments as Speilberg has been veteran of many many historic movies. Pace is slow but adaptable. 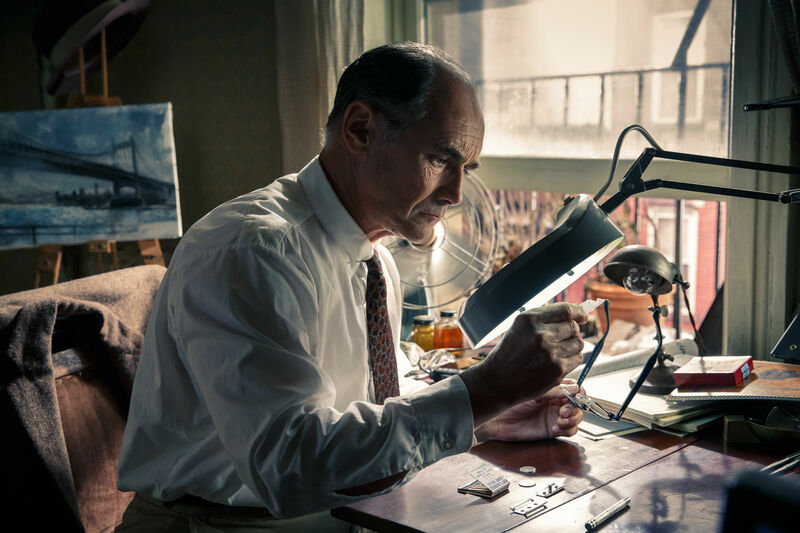 Mark Rylance as Rudolf Abel is a showstopper who deservingly won Academy Award for Best Supporting Actor for this role. Overall, Bridge of Spies is a decent history digging movie from a very important time-zone of the 20th century.